0 Comment September 22, 2016 Like? The WFX Expo is the world’s largest house of worship technology show. Tour the hottest booths at the largest church streaming show in the USA! Matthew Richards takes us to Wowza, ChurchStreaming.TV, StreamSpot and more in this walk through tour of the 2016 WFX Show! One of the most excited church based live stream provider at the 2016 WFX Show shows their latest “ONE” product which is a dedicated streaming applicance for churches. What is the most important feature? Ease of use along with automation. StreamSpot specializes in automation for churches and houses of worships starting to use live streaming as a way to grow their congregations! More information about the StreamSpot one can be found here: https://streamspot.com/one. 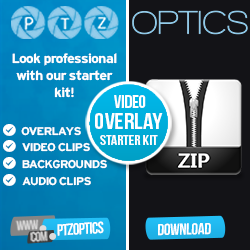 It features a HDMI and HD-SDI input for video ingestions and at the WFX Show they showed off the PTZOptics 12X-SDI.